Pinterest, for me, is like a new and improved way to bookmark the things I find on-line. I mostly use it to capture pages and cards. I've just started using Pinterest to capture sketches, too. 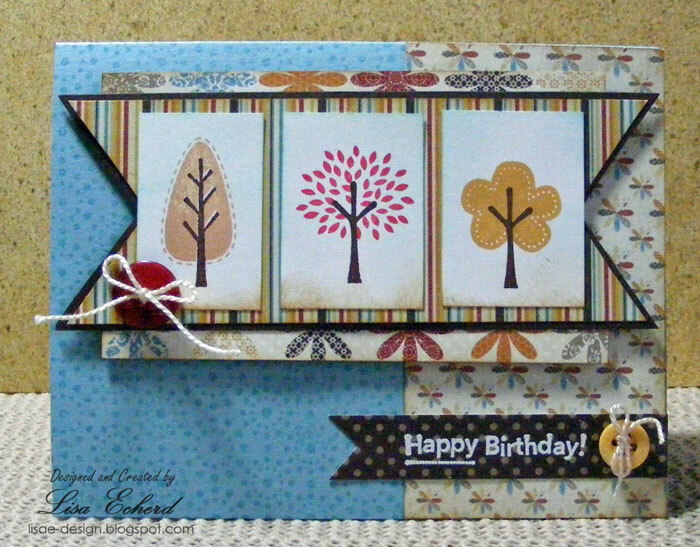 My card is based on a sketch by Pamela at Pamelaworldofscrap. Join in the challenge! 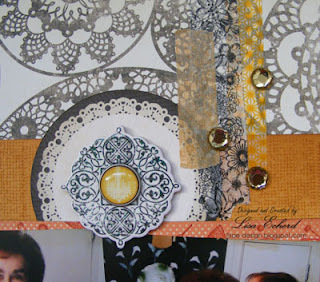 She also included a version of this for scrapbook pages. I think it would make a fantastic page, but I don't have time right now to do one. So I 'pinned' the scrapbook version in a new board I named simply "Sketches." Before, I had been downloading sketches I liked to my computer but I really don't need to do that. Pinterest will save them for me. 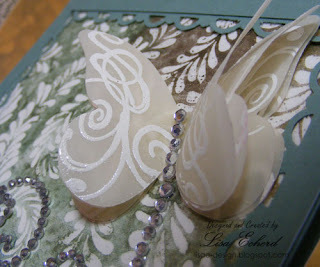 For the card, I used Stampin' Up! 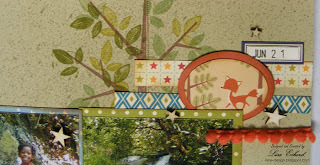 's Trendy Trees and my much underused Lily Bee's Autumn Spice papers. Thanks for stopping by today! I hope you are safe, warm and dry during this awful storm. When the weather is bad, or forecast to be bad, I love to bake. Sometimes it is biscuits or another bread with homemade soup, sometimes it is a sweet. 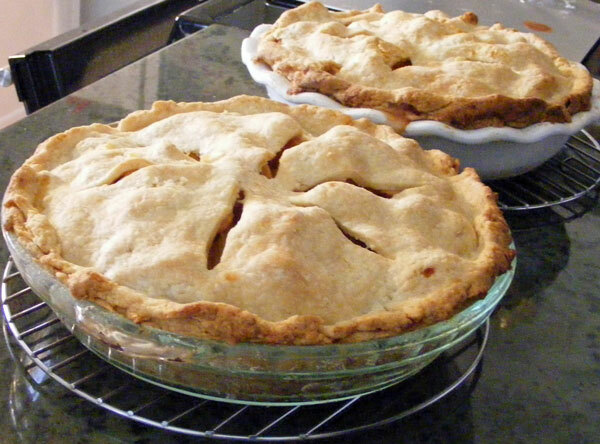 Today, I baked two apple pies - one for us and one for my Mother. My father swears he is off of desserts right now. Everyone in my family has an infamous sweet tooth so we will see how that goes. I'm not trying to tempt him; he announced this after I'd already offered to bake Mother a pie. So far, our weather is just a touch of wind. I think the worst of it is for everyone north and east of us. I hope and pray all will be safe. It's almost Halloween and boy did I get a great treat on Saturday. We were close to the Mighty Dollar and a friend had told me that had a bunch of new stuff in. They had TONS of Basic Grey - chipboard, woolies, brads, every kind of embellishment Basic Grey has made the last couple of years. (no paper though :-( I haven't been buying as much BG paper so I left the product specific embellies alone and went for the chipboard. 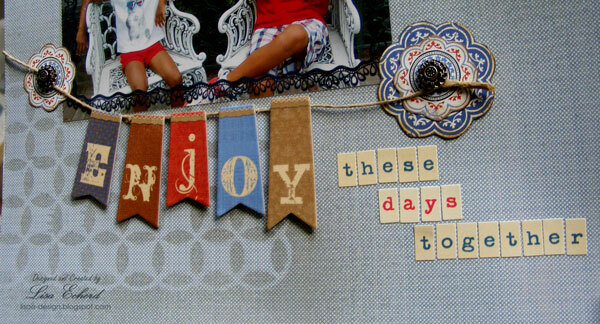 Just love, love their chipboard as you get so many of each letter. Can you believe I got all this for $10! 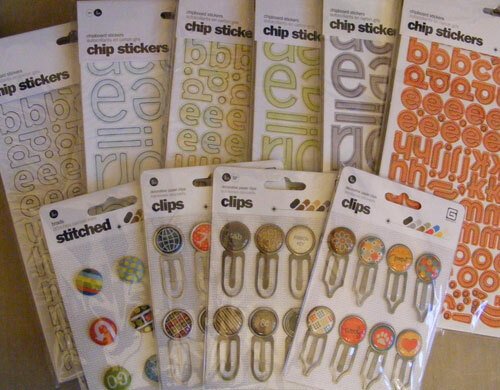 Those chipboard packs alone are worth $6 a piece. One final treat...it's time for the Blogger's Quilt Festival at Amy's Creative Side. Here is the link to hundreds of gorgeous quilts. This is a semi-annual event guaranteed to inspire. If you love fabric or color or just fantastic workmanship, head over and visit a few of these links. I haven't made anything to enter again this time. I've done some Lutheran World Relief quilts but those are incredibly basic - function definitely more than fashion. I loved visiting the festival as I've had an itch to get into my discontinued fabric samples and make something. Still haven't decided what that something is. I'd better hurry, I'll soon have more customer fabric to work up. I did work on a papercrafting project all weekend. No photos though. I want to wait until it is all done and there will be some video as well. Thanks for stopping by! Tomorrow I'll have a card and a tip for you. Hope you are safe and dry. My take on this month's sketch challenge on Rainy's (Susan's) blog was to flatten the design and remove almost all the layers. The challenge is open until the end of the month. I hadn't really planned it that way but after doing the background, I decided the 3 symbols would stamp really nicely right on the background. Then it was a challenge to find a way to do the ribbon without adding much bulk. 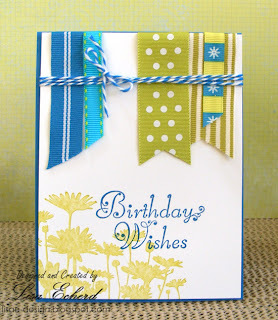 I split the background paper and put some twine in the groove for a very flat card. The background is stamped and embossed in clear ink on watercolor paper. I then used distress inks and water to add the color. I love the serene feeling and think this would work well for a more modern wedding card. What better wishes than peace, happiness and love! Thanks for visiting today! If you live anywhere in the Eastern US you are probably, like us, keeping an eye to the weather. Hope you are safe and dry in the coming days. My Mother's birthday was over 6 months ago. This weekend I scrapped the photos. Notice the little question mark next to the 'number' chipboard element. She won't let me reveal her age. Other than medical personnel, she doesn't tell anyone how old she is. At some point when I was growing up - when I was old enough to do basic math and still young enough to believe anything I was told, I came across my birth certificate. I figured out if I added the age I was then to the age my Mother was on the birth certificate, it was older than what age she was on her last birthday. Something didn't make sense. So I asked her about it. "Oh, they just made a mistake on your birth certificate," she said. Some time later, I was staying at my grandparents for the weekend and I told my Mother's oldest sister that my birth certificate had a mistake on it. "What kind of mistake?" she asked. "They have Momma's age wrong. It says X and she wasn't that old." A loud "hmph!" errupted from my aunt and she told me there was no mistake. That was exactly how old my Mother was when I was born. That night I learned something new and it had nothing to do with math. 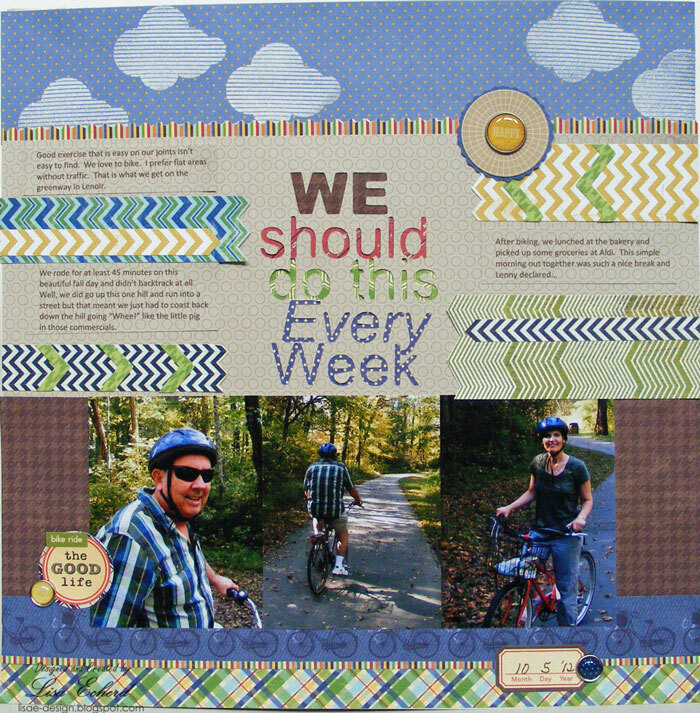 For the layout, I used several things from Artfuldelight kits including the October kit. I don't used a lot of high contrast color schemes, particularly black and white. This just isn't me, but it is my Mother. 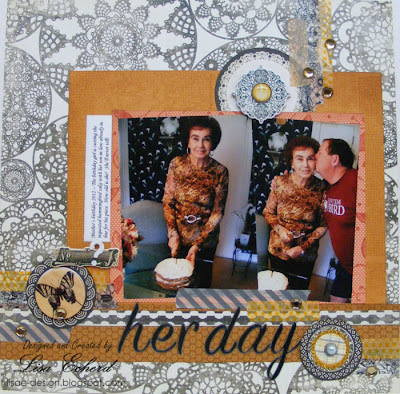 She wears these colors beautifully so the background paper from the kit was a great choice. I didn't have enough rust colored papers so I stamped and distressed some orange polka dot and cardstock to finish out my paper choices. 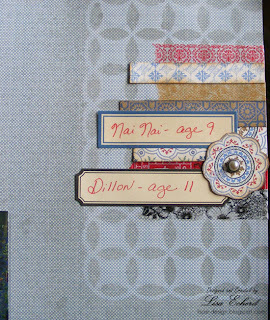 There were several Washi tapes in my stash in these colors so I used a few strips and sprinked on some rhinestones. I think this layout was inspired by the ones Shimelle makes. 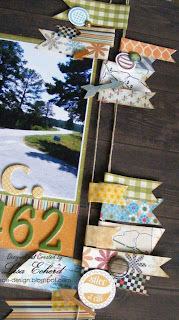 Two photos, lots of pattern paper and some tape strips in several places to tie it all together. Now back to ages. Have you ever lied about your age? The only time I have is for things on-line where they have no business knowing my real birth date. It is just for security. But take the entire day to go see a customer and do a tad of regular shopping and Voila! 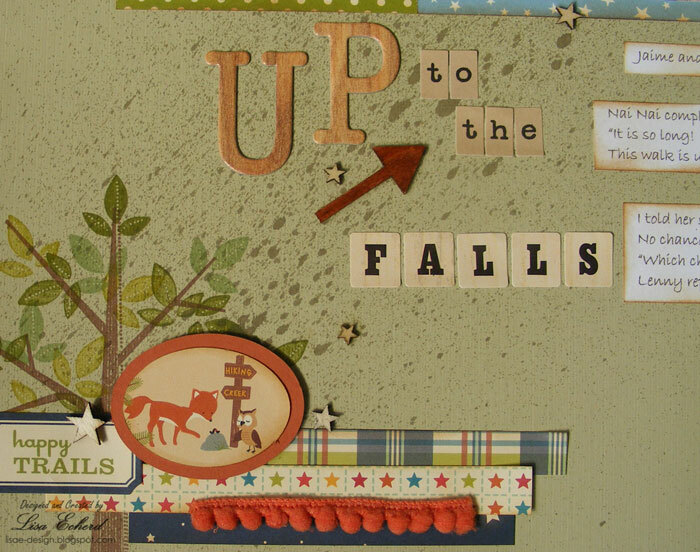 New stuff appears on the Stampin' Up! Clearance Rack. Unfortunately, I understand some things have already come and gone. There are still some great deals. If you don't already have them, I highly recommend the Pretties Kit or one of the Hardware kits as these are greatly reduced and go a long way in scrapbooking and particularly card making. Check out SU! 's bargains here. ETA: Scratch pretty much everything I just said!!!! I went to place my clearance rack order and the first four items I picked were already sold out! They were still showing as available until you tried to add them to the cart. I found this incredibly frustrating. Stampin' Up! is a large enough company to invest in software that will remove items from their site when they are sold out. This is really irritating after checking their site every day the entire month and then the one day I'm gone, the things I want get gone. 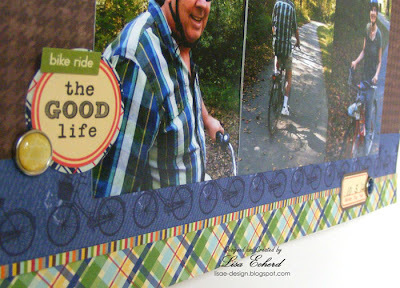 If someone else made a good quality 12x12 cardstock, I'd be switching. Oh, well, end of my vent. 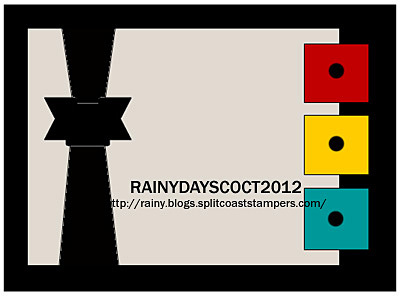 Here's my entry for this week's sketch challenge at Splitcoaststampers. 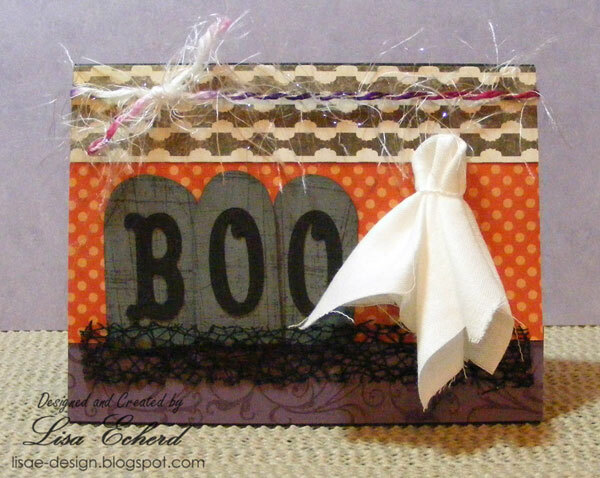 This is also my one and only Halloween card. For the ghost, I cut a square of scrap white cloth and pinched it together and tied off with twine. I cut the letters on the Cricut and hand cut the tombstones after stamping with the SU! 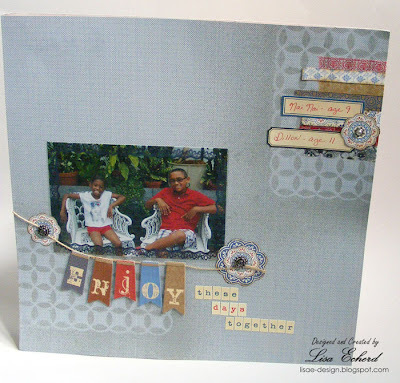 Sanded background stamp. Speaking of Stampin' Up! I've been dogging their website daily to see if they have added to their clearance rack. For the last two years, they have restocked clearance in October. They discontinued a ton of stuff last year and I'm hoping some of it reappears on sale. When they mark stuff down, they really give a good deal. If I see more items being added, I'll be sure to post on my blog. "We should do this every week!" my husband proclaims at least 3 times as we are riding along the greenway in a nearby town. It was a wonderful outing. We've biked there before but for various reasons - mostly procrastination and then various aches and pains - hadn't been back in two or three years. I hope it won't be two or three more years before we load up the bikes and take them for a ride through several miles of flat trail. A flat, traffic free area of biking is almost unheard of in our part of the state. We didn't make it back last week and aren't going to get there this week but I do want us to get out and do more things together. We did a window treatment installation on Monday that took several hours. Does that count as an outing? It was gratifying but somewhat less relaxing than peddling along on a perfect sunny, not too hot, day. 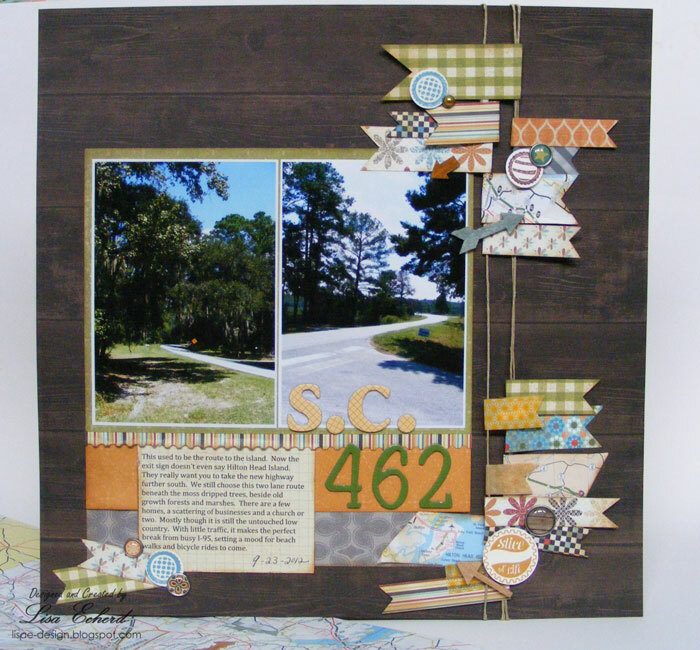 For the layout, I was inspired by this one from Scarlettbirddesigns. She used the negative space behind her cutout title to place designer paper. I did multiple lines for my title and different papers for most of the lines. This was surprisingly easy. I used my SCAL software and the Cricut but you could use a Silhouette. I typed each word as a separate entry and then just arranged them in a block. After cutting, I only had to piece in the center of the 'o' 'e' and 'd' letters to finish off the title. It is a cheap way to do a long title. She cut some individual papers for a chevron design. 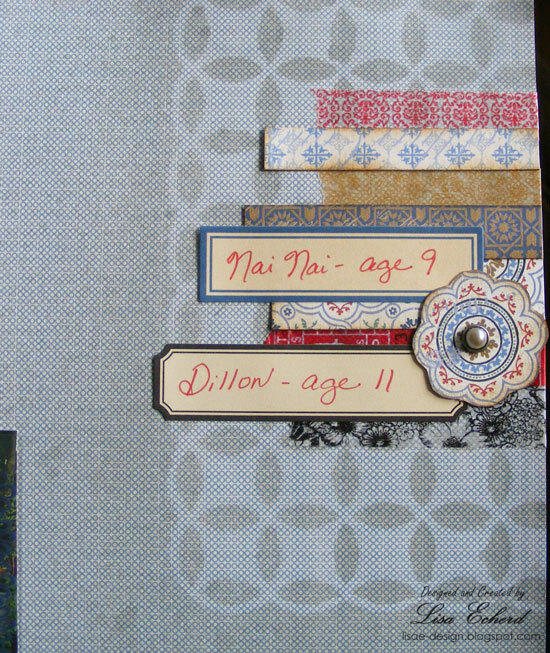 I liked the movement that implied and cut strips of various chevrons to surround my title and create space for the journaling which was printed on the same paper as the background. 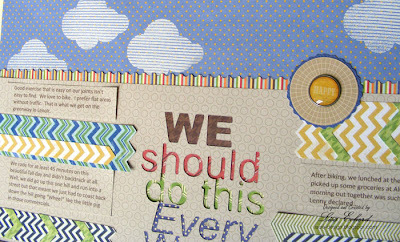 The clouds are stamped on some paper from Stampin' Up! The bicycle paper is from who else? Little Yellow Bicycle. Most of the rest of the paper is Jillibean Soup Macho Nacho. 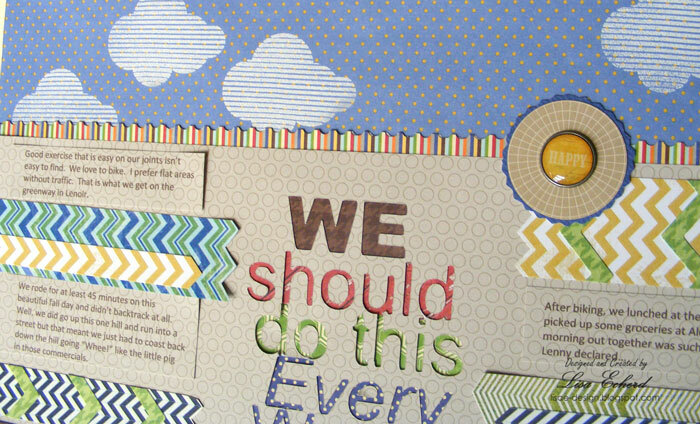 These colors are fantastic and so useful for our pages. 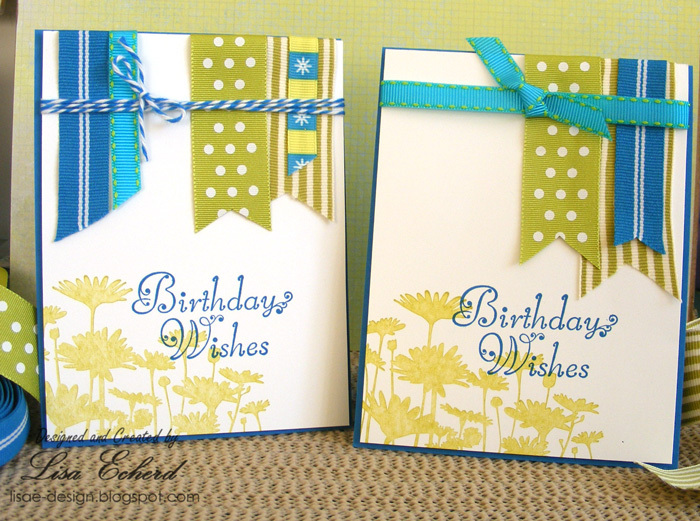 If I could send one wish to the paper crafting community it would be MORE BLUE! More true blue! Do you and your honey have outings or 'date days' as we often call them? What do you do? I'm always looking for new ideas. Oh, my! It's half way through October already. I've done a few Christmas cards but I haven't really gotten into serious production yet. If I don't get going, I'll turn around and it will be Thanksgiving. 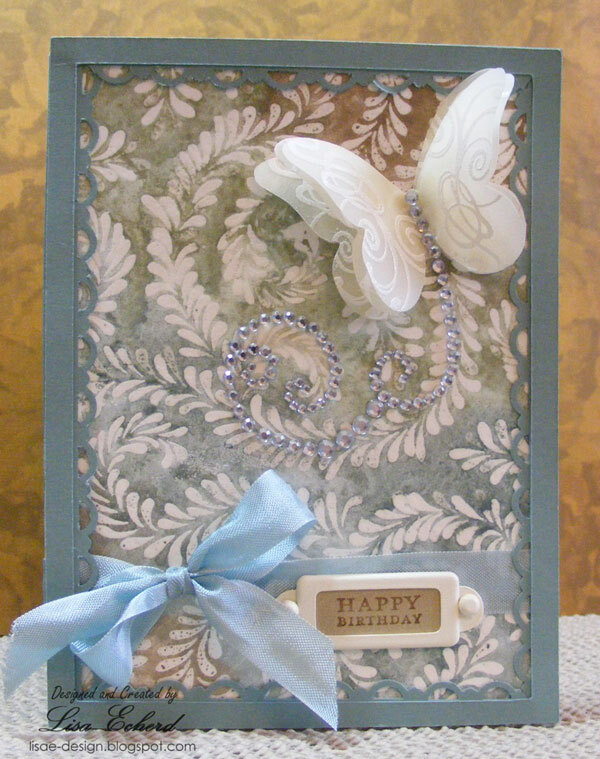 I have worked some on my Mother's card design. She uses at least 25 cards so I have to come up with something where I have enough of the materials. Also I want to think about postage this year. The last two years I've made her cards that required extra postage - one square one and one lumpy one. 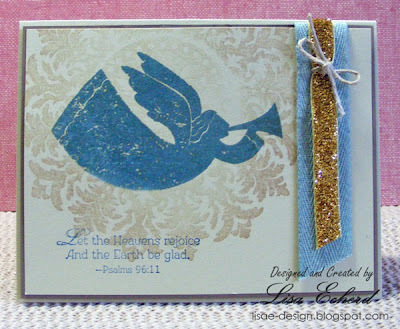 She can do this; however, there isn't any reason I can't design a pretty card that only needs one stamp. 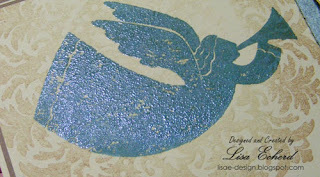 heat embossing - my all time favorite technique makes any holiday card look as good or better than Hallmark. 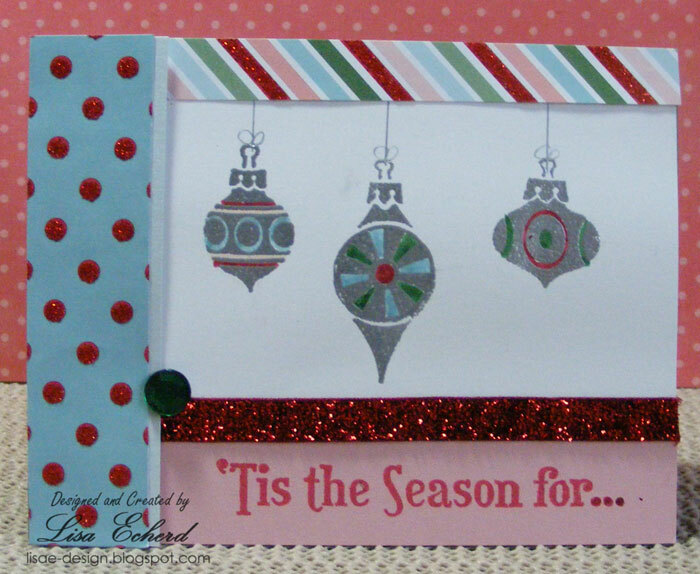 The card above has the ornaments embossed in Stampin' Up! 's silver powder. A plus for this card is the stamps came from the $1 store. 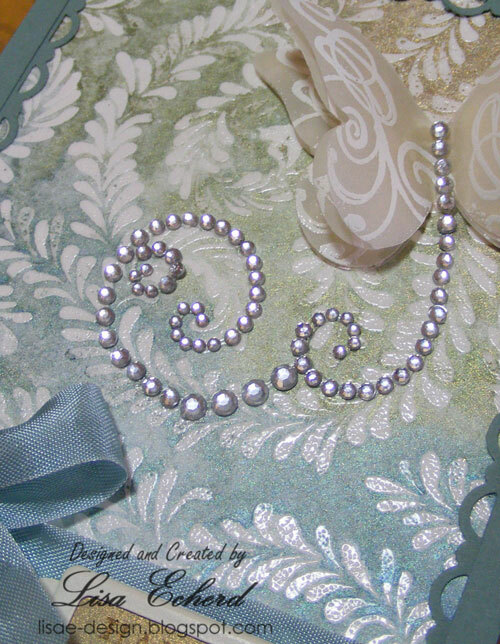 flat ribbon - fold ribbon around a layer and adhere to the back of a side that will end up covered or use a banner of one or two ribbons for a pretty effect without the knot and bulk. Again the card above uses a fancy ribbon but it lays flat. Baker's twine rather than ribbon. Pretty designer papers. There are more and more holiday papers every year and now we can get them in 6x6 pads so you don't have to invest a lot to have beautiful papers to adorn a card. Embossed or glittered papers as shown on the card above give you the effect without the extra work. A 4" x 9" card for a letter envelope. It is fun to do a different size but many take extra postage. 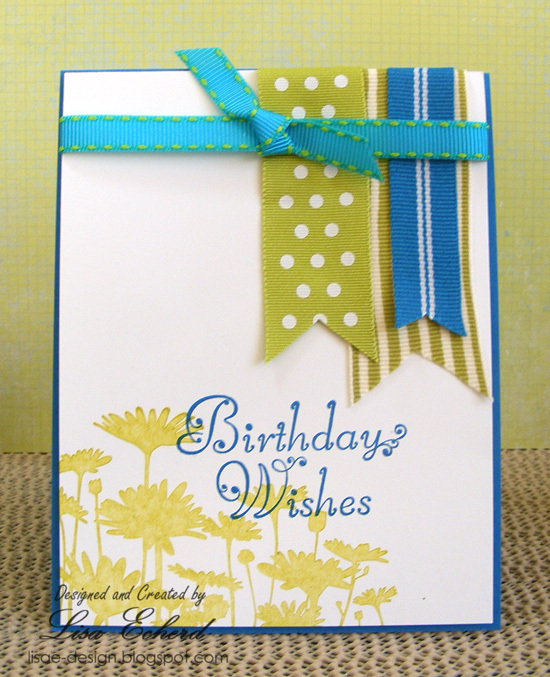 A card finished 4" x 9" fits in a regular business envelope. Speaking of envelopes, stamp an image on the envelope for an extra handmade touch that costs nothing and takes very little extra time. Avoiding bows, brads and flowers really help reduce the bulk. The card shown above does have a brad, but it could easily be left off. Are you making holiday cards this year? 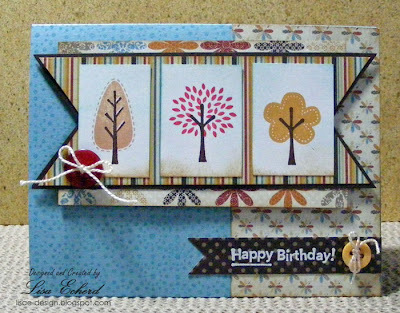 This card uses a sketch from Pamela's World of Scrap. Just a few hours left to get in a card for her challenge. 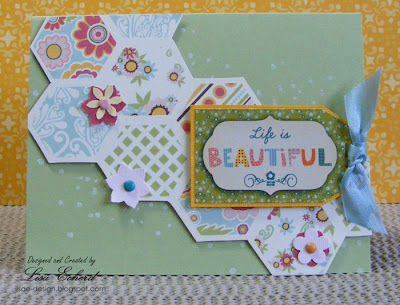 Her sketch uses scattered circles, I went with hexagons and did it the super easy way. I just cut around some hexagon shapes in this Fancy Pants paper, added a few punched flowers, stamped on a few dots, popped up a Cosmo Cricket sticker and that was it. 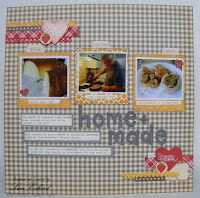 Last post I had a quick layout. This is not a trend. The layout on my table now is taking some time. I've been fussing with it off and on all day. I just looked at it and it still needs something. What thing, I'm not sure. Some layouts just need to sit there and marinate overnight until I can figure out what is missing. Maybe it is my brain that is marinating. I don't know. Anyway, it is nearly 9 and two of my favorite shows are about to come on at the same time - The Good Wife on CBS and Revenge on ABC. We've chosen to watch Revenge this evening and catch The Good Wife on-line later in the week. Oh, I wish I were here. 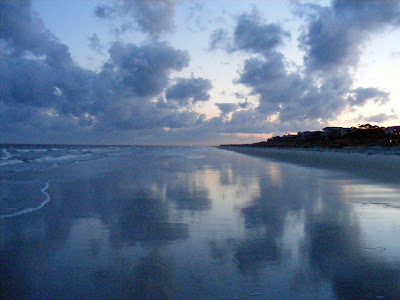 Here is Hilton Head's beach at sunset a couple of weeks ago. I'm not there of course, I'm here having one of those days. I'm sorry I won't have a Tuesday Tip post today. This is a busy work week and this morning I spent half the morning creating something and the other half the morning taking it apart. Urrr! I've got some uncooperative fabric. I think things are back on track but I'm behind. So, later in the week, I'll post a layout and card from last weekend. Hope everyone is having a more productive week. Happy card making day! Hope everyone is getting to do some crafting today. I feel like I've been on withdrawal the last few days. I've fiddled a bit with a Christmas card design I'm planning for my Mother's cards all week but have only completed one card and haven't scrapbooked at all! So I'm happy to have some time to make cards. You practically have to make one on World Card Making day, right? World Card Making Day with a big, big prize! The catch to this one is that you have to actual mail in your card and it won't be returned. The cards will be judged. I was intimidated at first figuring they would want super elaborate cards, but the blog hop showing last years winners had a more clean and simple style. Clean and simple isn't always the easiest for me either. I'm somewhere in between. I still may give it a shot. Contest ends October 15. 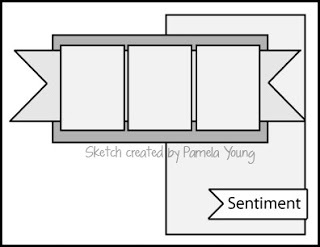 Pamela's World of Scrap has several sketches and contests with prizes. My card below is for one of her sketches. Artfuldelight has a monthly sketch which is similar to one of Pamela's. The card at right is for this one. 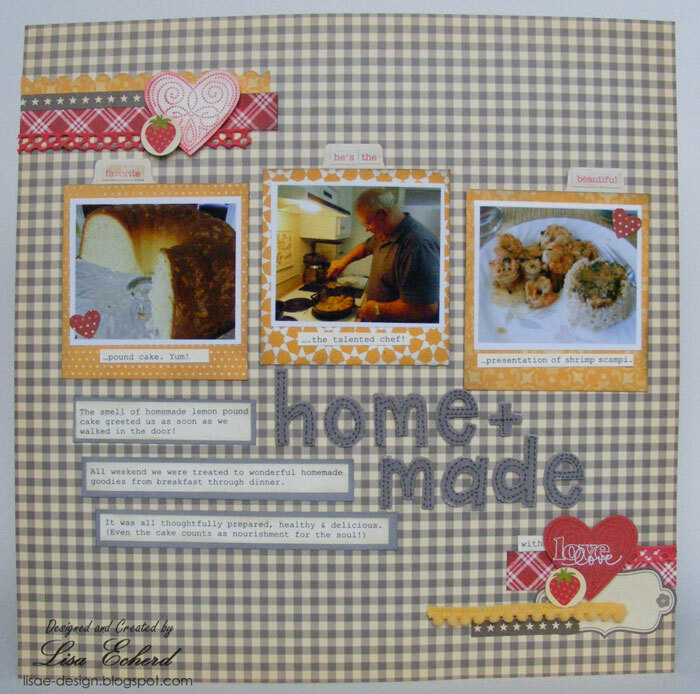 Operation Write Home has a blog hop and challenge. 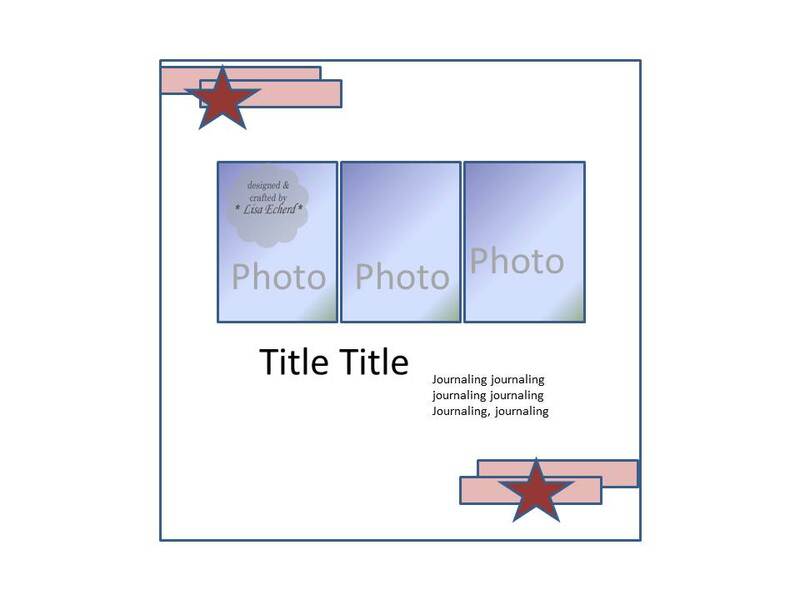 If you are making Christmas cards for OWH, the deadline for submitting is coming up soon so be sure to check their 'mailroom' portion of their site for details. Of course you can always make another type of card and submit it any time. I keep a priority mail box in my scraproom and just add to it as I make cards. When I get 30 or 40 which is about what one box will hold without squishing too much, I send it in. These two have already been placed in the box for my next shipment. 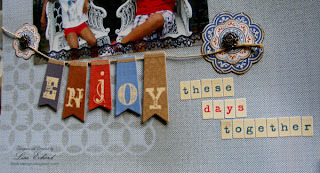 I loved getting to use some wider ribbons that have been in my stash a long time. Thanks for stopping by! Hope you have a fun crafting weekend. We enjoyed a fall trip to Hilton Head Island week before last. We've never been quite this late in the year. Really, you couldn't tell it was fall there. You can tell it isn't summer though because the crowds are gone and the prices were lower. We could actually cross the highway on our bikes without much of a wait at all. It reminded us of how quiet the island was when we first starting going there. 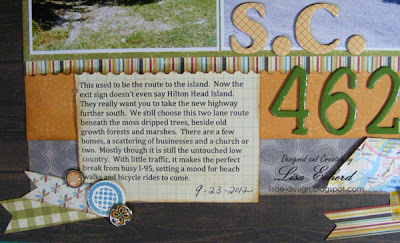 When we started going to HH Island over 20 years ago, we took an exit of I-95 that was labeled as a route to the island. It is a very unpopulated stretch of road and I just love it. It is true low country and we still go this way. Finally this year, we stopped part way and I took a couple of photos. This used to be the route to the island. Now the exit sign doesn’t even say Hilton Head Island. They really want you to take the new highway further south. We still choose this two lane route beneath the moss dripped trees, beside old growth forests and marshes. There are a few homes, a scattering of businesses and a church or two. Mostly though it is still the untouched low country. With little traffic, it makes the perfect break from busy I-95, setting a mood for beach walks and bicycle rides to come. 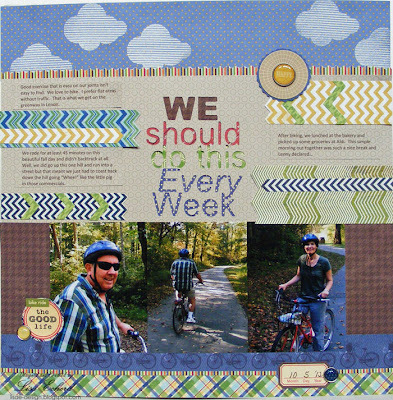 For the page I used some Simple Stories Harvest Lane papers along with this woodgrain background paper from their Take a Hike line. 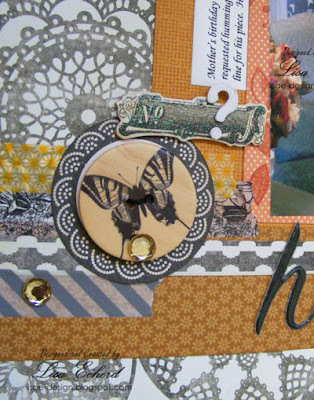 I also mixed in some Autumn Spice papers from Lily Bee. These coordinate really well with the Harvest Lane collection. 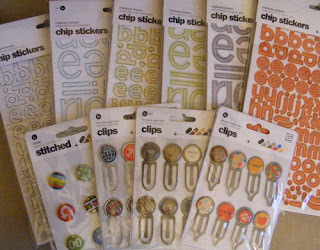 The stamp set I won as blog candy last week had some good circular images including the bottle cap that says "Slice of Life." In addition to the pattern papers, I cut up some old maps finding the sections of highway we drive and including them as banners. I hope this stretch of road continues to be largely undeveloped and brings us that bit of low country before we even get to the island. Happy Tuesday! I have a layout and video today. Feel free to use the sketch for your pages. If you publish the pages on your blog or other site, please give a link back to this post. The video goes through from sketch all the way to the final embellishments. 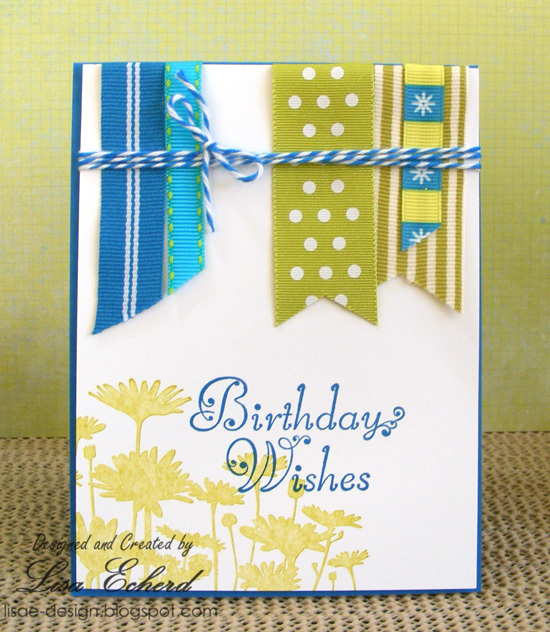 Emphasis is on the stamping on the background and choosing embellishments. 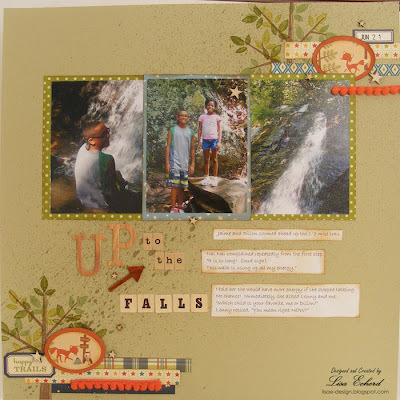 There are some tips if you are nervous about stamping on your pages. This starts about 4 1/2 minutes into the video. 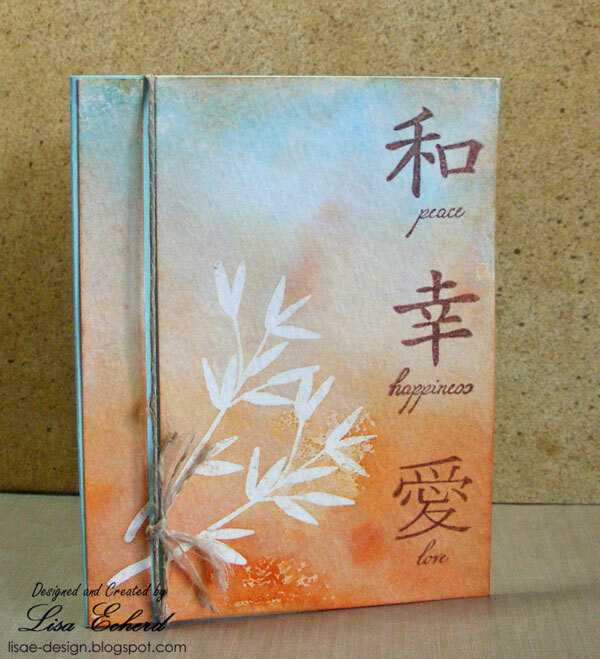 Stamps really make your pages your own. I also cut some designs from pattern paper for embellishment. Sometimes I find it tough to use these cute prints in large amounts. The little wooden stars from Studio Calico are a great accent. I think they are the casual version of rhinestones or pearls for scattering over your layout. The focus of this layout was more on the hike than the actual falls. Jaime and Dillon rushed ahead and Nai Nai practically drug her feet with every step and stayed back with us 'old folks.' She is not a nature lover. She complained all the way then suddenly asked us, "Which kid is your favorite, me or Dillon?" Lenny responded, "You mean right now? Right now which is the favorite?" It was funny.